Mark asks: Who was the first comedian to do the slippery banana peel routine? There are some things in this world that are just inherently funny; a pie in the face, an unexpected squirting flower, and a kitten in a shark costume riding a roomba chasing after a duck are just a few of the best examples. 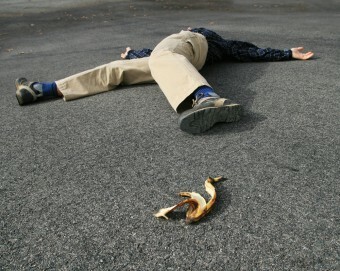 But nothing has quite become the staple of physical comedy as the “slipping on a banana peel” gag. Physical comedy, when humor arises from physical acts (i.e. pratfalls, weird faces, or walking into things) rather than words, is the world’s oldest form of comedy, dating back at least to ancient Egypt in 2500 BC. This type of humor is often dependent on schadenfreude, the ability to derive pleasure from the misfortune of others. Clowns and mimes during Greek and Roman times often employed these techniques to the delight of the audience. Bald and heavily-padded, these clowns would smack each other around, eliciting laughter from an audience all too happy they weren’t the ones onstage and being hurt. Sometimes, they would even employ the use of a stick (a “slapstick”) to heighten the sound of the whack to give greater comedic appeal. Minstrel shows of antebellum America used physical comedy as a way to reinforce stereotypes and mock African-Americans by depicting them as lazy, clumsy, and dim-witted. In the 19th century, the slapstick was passed to the English and American vaudeville halls, where the most popular acts were comedy based. Performers slipping, smacking, and falling across the stage made audiences go bananas. The advent of film was the perfect medium for the very visual gags of physical comedy. Buster Keaton, Harold Lloyd, and Charlie Chaplin all perfected their acts on screen, utilizing what film was great for – the ability to direct the attention of the viewer. In 1866, a man by the name of Carl B. Frank began importing a long, yellow fruit called a banana into New York City from northern Panama, from right near the present-day Canal zone. This wasn’t the first time bananas had made their way to North America. In the early 19th century, sailors returning from trips to the Southern Americas would load up on this tropical cargo, attempting to make a small profit. This was the first time, though, that someone tried to mass import this mostly unknown fruit. It worked. At the Centennial International Exposition of 1876 (the first World’s Fair to be held in the United States), bananas wrapped in tin foil were sold for ten cents each to the curious shopper. Within a few years, bananas became a favorite fruit and a common street food. In any event, coupled with lack of basic civil services like trash cans and street sweepers, banana peels were often thrown onto the streets left to rot and decompose. The more rotted a banana peel was, the more slippery it became. In 1879, the popular magazine Harper’s Weekly criticized people for haphazardly tossing their banana peels on ground by saying “ “whosoever throws banana skins on the sidewalk does a great unkindness to the public, and is quite likely to be responsible for a broken limb.” This wasn’t just a tall-tale either, several period sources claimed that banana peels were responsible for broken limbs, including some that reportedly were so badly broken that they had to be amputated. It became such an issue in American cities that in 1909 the St. Louis city council outlawed “throwing or casting” a banana peel out in public. That said, some scholars have claimed that banana peels in the streets began as a euphemism for something less edible. During the 19th century, horses were the main mode of transportation. As the horses clobbered their way through town, they would leave large piles of their droppings. People were hired to clean this up, but in cities that didn’t provide this civil service, the piles sat unattended scattered through the city. Those who did not pay attention were liable to slip and fall into this rotting piles of horse manure. Of course, besides being gross and unsanitary, this was quite funny to onlookers. Since having people fall in big piles of horse manure on stage was both impractical and icky, the performers substituted banana peels. In addition, the yellow color of the skins made them stick out on stage, making it the perfect stand-in for horse manure. As they watched and laughed along with the show, every city dweller knew what these banana peels stood for. The first known person to use the banana peel as a physical comedy instrument was “Sliding” Billy Watson. Famous for his sliding entrances from the wings of the stage, Bill Watson was one of the most successful and rich vaudeville performers of his day. He had seen a man on the street attempting to keep his balance after slipping on a banana peel and found it so amusing, he incorporated it into his act. Another comedian, Cal Stewart, incorporated banana-related humor into his stand-up act. Bananas were quickly becoming America’s most hilarious fruit. The first time the banana peel gag appeared on the big screen was in the Charlie Chaplin movie By the Sea. Playing his world famous character “The Tramp,” he tosses a banana peel on the ground without paying any attention, only to slip on his own garbage later. Soon, all the silent film stars were doing their own version of the banana peel gag. In the Harold Lloyd comedy The Flirt, featuring Bebe Daniels as the love interest, Lloyd carefully peels a banana and tosses the skin on the ground. A rude waiter slips on it and goes crashing to the ground. Buster Keaton took the joke to the next level in the 1921 film High Step. Spotting a banana peel on the street, Keaton walks over it and silently mocks the peel for trying to do him harm. Of course, he takes one step further and slips on a banana peel he didn’t see. The banana peel gag continues hold it’s place in comedy, from Woody Allen in the 1973 film Sleeper to 1995’s Billy Madison. So, next time you see a banana peel, think of a 19th century city slicker or “Sliding” Billy Watson or Buster Keaton sliding their way on a banana peel and into comedy history. It’s okay to laugh at their misfortune. We’ve been doing it for decades. “Sliding” Billy Watson wasn’t the only Billy Watson to make a name for himself in the vaudeville circuit. Billy “Beef Trust” Watson was widely known for his burlesque shows starring female performers who were in the neighborhood of 200 pounds. Hence, the rude nickname. Even today, slippery banana peels are still causing trouble. In 2010, a woman by the name of Ida Valentine slipped on a banana peel while shopping at a 99 cent store in Fontana, California. She suffered a herniated disk and spent nine grand on medical bills. She sued the store for damages after refusing a 44,000 dollar settlement. So back in the day, there were so many banana peels on the street, people couldn’t help slipping on them? Considering how expensive imported fruit was 100 years ago, that just doesn’t pass the straight-face test. I think QI’s explanation (http://www.comedy.co.uk/guide/tv/qi/episodes/8/12/) that banana peels were a stage- and screen-appropriate substitute for horseshit is a lot more likely. Victorian and Edwardian cities contained tens of thousands of horses, so slipping on manure was a very real problem, and something that any city-dweller would be familiar with. Even if everyone ate several bananas a day (unlikely), the resulting waste wouldn’t begin to compare to the manure that 50,000 horses (the estimated number used by London public transport alone in 1900) would produce. @Julia K: Yep, that is a distinct possibility. Matt mentions that mid-article as well.